That nearly full moon will not make it easy to find Quadrantid meteors. The shower peaks on the 3rd and 4th. Earth is at perihelion on the 4th. This is a great month for seeing Mercury. 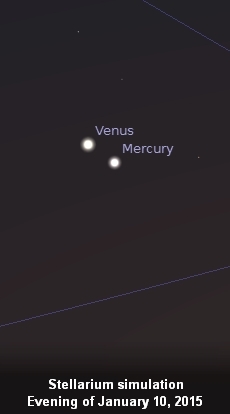 It’s just below bright Venus in the west right after sunset the first half of the month. Although they will not be due north and south of each other this month in either right ascension or celestial longitude, they are just 0.6° from each other on the 11th. So as most astronomers like to define it, there isn’t a conjunction of these two planets this month. But don’t worry too much about that. This close call is worth seeing no matter what you call it. The best time to see Mercury will be on the evening of the 14th. It’s 18.9° east of the sun. But it’s fairly close to the sun for this greatest elongation. The messenger planet will be at pereihelion and orbiting fastest just one week later on the 21st. And then it’s already at inferior conjunction on the 31st! So right after the close call with Venus on the 11th and that greatest elongation on the 14th, Venus and Mercury pull apart fast. Venus will remain an evening object into the middle of this year. On January 11th, just three weeks after Earth has gone through its southern solstice, the red planet does the same. Mars is in the southwest just after sunset. If your skies are dark enough and your telescope powerful enough, you may be able to spot bluish Neptune near it on the evening of the 19th. Moonlight won’t interfere that evening. However, a few nights later on the 23rd, a growing crescent will pass Mars. 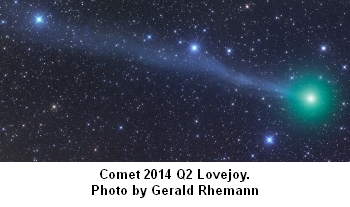 Comet watchers will want pay attention to 2014 Q2 Lovejoy. Australian amateur astronomer Terry Lovejoy discovered it in August. As of mid-December, it had become a naked eye object, although only for those in the darkest skies. It will pass about 0.47 astronomical units from Earth on January 7th and cross the celestial equator on the 9th. It’s distance, position, and the fact that it’s still approaching the sun could make it much brighter around this time. The object’s perihelion will occur on the 30th. Comet Lovejoy is currently in an orbit of about 8,000 years. Jupiter is already visible not long after sunset, and it’s rising earlier each night. This month, it’s slowly backing away from Regulus. The big planet will continue heading toward Cancer until April when it resumes direct motion. Saturn is a morning object heading away from the dim diamond of Libra and toward the claws of Scorpio. Watch it pass by the star Acrab later this month.